The sole of the Infinite is characterized by a low 3-4mm drop, firm and surprisingly responsive cushioning, and a meta rocker. One of the first things I felt even walking in this shoe was the pronounced meta-rocker, which is just excessive toe-spring (upward curve toward toes of sole at forefoot) and moderately curved heel. This is common of Hoka shoes and the Infinite is not much different other than the late-stage meta-rocker, which simply moves the beginning of the toe spring toward the front of the shoe to create a more stable base for the metarasal heads (more on this later). Why is this needed in a Hoka shoe? Because the thick midsole has no flexibility and toe spring is needed to smooth out the ride. The sole is surprisingly firm (but still cushioned) for a Hoka shoe as I mentioned and this adds to the sensation of stability. 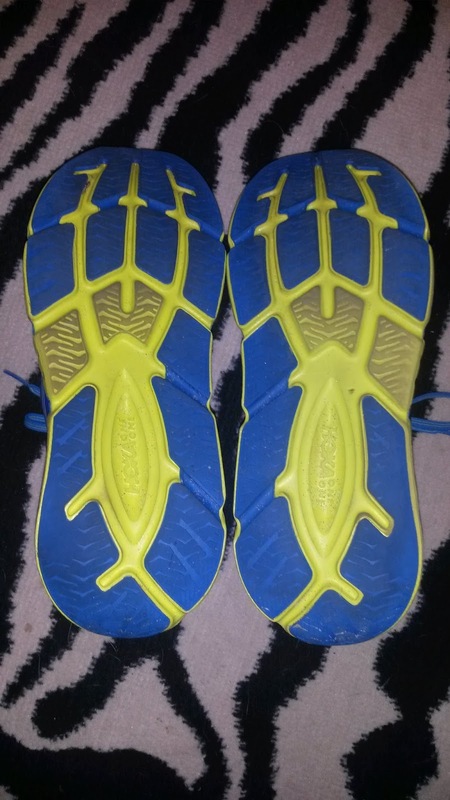 I very much appreciate the increased firmness as it decreases the energy loss and instability I have felt in the majority of Hoka shoes I have tried. 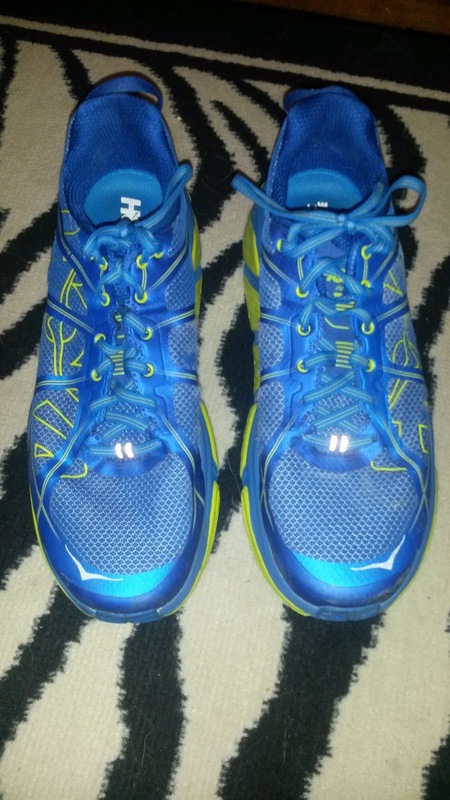 While not a shoe I took on anything but long and easy runs, the increased firmness of the Infinite contributed to it being one of the most responsive Hokas I have tried. That however is not saying much, but it is a step in the right direction. 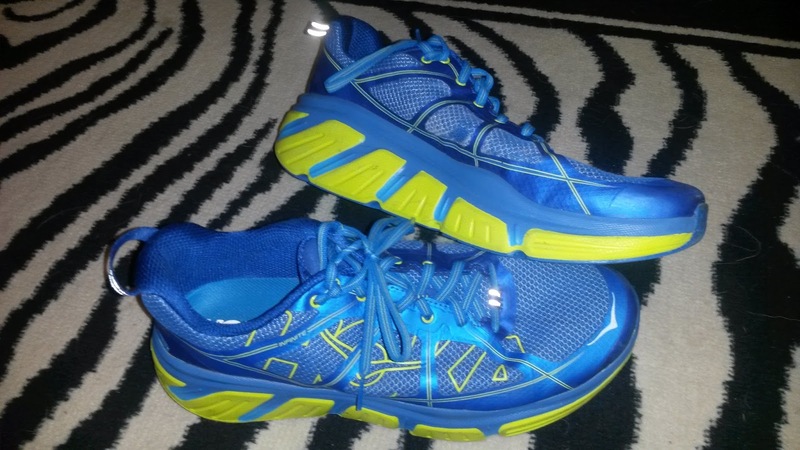 I am very excited to try the Hoka Tracer, which I hear is VERY responsive, a great racing shoe and massive departure from previous Hoka shoes. Along with the wide base (common of Hokas) and the elevated side walls around the medial and lateral aspects of the foot, I can see how Hoka would bill this as a stability shoe without the need for traditional methods such as second density foam or posting. The elevated side walls are simply the sole coming up high and the foot sitting lower into the sole than most shoes. This does take some getting use to as initially it feels like the sole is pressing into the entire medial length of your foot, but this mostly disappeared after about 50 miles when I got used to it. When I put the Infinite's on after having not worn them for a while, that is one of the first things I notice and I hope Hoka can somehow get the medial side wall to fit a little better into the arch. The fit of the upper in the Infinite is far better than my experience with the Huaka. The upper fits to the foot much better, although it feels a little tight on the pinky toe initially. My personal experiences with trying Hoka shoes on led to me realize that the Infinite has one of the best forefoot widths of any previous shoe from this company, so those with slightly wider feet may be able to run in the Infinite without too much discomfort. I would describe the current forefoot to be slightly above average but not too roomy (especially with the mild initial pinky toe pressure). The quality of the upper is also improved. The insole is not slipping at all and appears to be anchored fairly well in the shoe without being glued in. The upper looks and feels much better and smoother than the Huaka as well. However, after about 70 miles of use I have begun to see delamination and wear of the upper at the medial and lateral midfoot. I know some of my friends who tear through uppers very quickly. I have not had any issues causing damage to uppers since my experience with the Kinvara 1 and 2 (which tore after 100-150 miles). For a shoe of this quality and type, I do think wear there after less than 100 miles is disappointing. Hopefully this will be addressed in future versions. The relatively light weight at around 10 ounces and firmer midsole of the Hoka Infinite surprised me. The firmness contributes to a more responsive Hoka shoe than I have experienced in the past and the late stage metarocker makes this shoe feel lighter than it is. That last part was surprinsing regarding the meta rocker, but that may be from the attempt to improve the smoothness of the transition. Despite all the above, the Hoka Infinite is still not what I would call a responsive or fast shoe in general (just responsive for a Hoka). This is definitely a training shoe for those who need mild stability at most (and neutral runners will easily be able to run in it without issues). The oversized midsole does slow the shoe down and the lack of forward flexibility compensated for by excess toe spring makes it difficulty to run fast in this shoe. Long, easy or recovery miles however are what this shoe excels at. There is enough midsole there to help sore legs recover and enough firmness to not feel like you are running on sand. From a stability standpoint, Hoka has done some great things without having to use traditional methods (that many times interfere more than they correct). I've talked most of these aspects before like how a wider base and firmer cushioning inherintely create a more stable surface. The Infinite does have firmer cushioning and a very wide base (the second one being a classic characteristic of Hoka shoes) which work very nicely together. 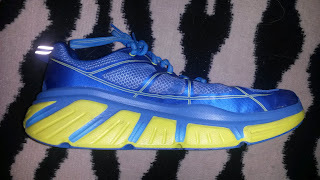 Previous Hoka shoes that had the very wide base but excessively soft cushioning created shoes that basically canceled out the intended stability and ended up feeling like soft bricks. The increased firmness makes the shoe feel faster and more stable than previous shoes. The increased side wall height is not something I have seen frequently before and while I like the idea, I think it still needs to be smoothed out. The side wall really needs to be fit to the medial arch of the foot better, instead of just being a straight slab. A good use of stability is something that compliments the foot instead of forcing it a certain way. The increased side wall height isn't bad, it just could be better as there is the potential for blisters and rubbing based on the mild pressure I can feel on the medial arch. My biggest issue with Hokas are the complete lack of flexibility. Like previous versions, the Infinite has almost zero flexibility especially in the forefoot. This is compensated for by the excessive toe spring, but toe spring does not engage the natural forefoot rocker. This is another reason this shoe does not feel as fast as it could be. When you take out the natural forefoot rocker, the calves can't contribute as naturally to forward propulsion (and they are very important for that). Instead, having an artificial rocker at the forefoot makes it feel like you are going along for the ride rather than contributing to it. This is different from heel rockers, which should be incorporated into shoes because the calcaneus bone is shaped like that and there is no articulation at that point. The heel rocker is simply using physics and momentum to get you forward. The metarasals and forefoot rocker are very different because you have mobile joints there that are working with muscles. There is a combination of force generation and joints actively directing forces at the point of contact. Those metarasal phalangeal joints need to be able to flex and extend naturally for the rocker to be utilized best. Yes there are cases in patients where they may have a fusion or some biomechanical issue and require an artifical forefoot rocker to get forward progression. They are more than likely not going to be running fast times though. The metarasal phalangeal joints are joints like any other in the body. They can get tight due to a variety of reasons and their mobility can be improved in most individuals. And trust me that will improve your running if you lack mobility there. That lack of mobility can also come from improper positioning, such as the big toe deviating laterally... also called a Halux Valgus. Joints move best when they are aligned properly.... another reason for shoe companies not to make narrow toe boxes that quickly curve in on the medial side... but that's a post for another day. Finally, the trade off with these thick Hoka shoes is a lack of prioprioception. Runners already have terrible lower body awareness and will consistently self report completely inaccurate foot contact positions and joint angles. And when you can't feel the ground at all, that means your body has even less of an idea of where your foot and ultimately your lower leg is in space. Good prioprioception (body awareness) usually comes from forces going through joints and activating prioceptive receptors located in the joints. These in turn tell the brain where the joint is in space. There are also many in the muscles themselves that react to muscle tension, but we will focus on the ones in the joint for now. Yes I understand that many runners can now run again thanks to the excessive cushioning in maximal shoes. Some people may just have bone on bone joints and have just worn their cartilage down over the years. There are also plenty of people running with bone on bone joints with zero cartilage that don't have pain. This is also a topic for another post, but pain does not necessarily mean something is wrong in that body structure. The medical and scientific community are only just beginning to understand this. Anyway (off topic again), if you need the excess cushioning to make you feel better, go for it. I would prefer a balance in the middle where yes you are protected, but you also get some appropriate force through those joints, which not only tell your brain where your body is in space, but also signals the muscles to activate to protect and stabilize those joints. It makes sense that your muscles don't have to turn on as much to protect a joint if a shoe is providing the cushioning. The problem lies when the cushioning is excessive and the muscles turn on late due to delayed perceptive input. Optimally muscles, especially postural muscles, should activate a few milliseconds before they have to fully brace for impact (it is common for postural muscle activation to be delayed in those with chronic pain... especially back pain). So instead of more vertical forces, you may have to deal with more horizontal forces as your body thinks it doesn't have to stabilize as much and your joints may drift farther outside the norms. You may not be getting as much compressive force, but you may increase the amount of shearing/torsional and tensional force as the bone bends more. So as per usual, everything in moderation... including cushioning. 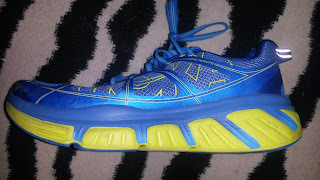 This is one of the many reasons I am so excited to try the Hoka Clayton and Tracer. I am happy with the increased firmness of the Infinite, because you get a little more force through those joints and a little more feedback. However, that midsole is pretty thick, so there is still some work to be done... but that is what Hoka is known for. (I'm almost done with this post... I promise). I am very impressed by Hoka's first mild stability shoe. 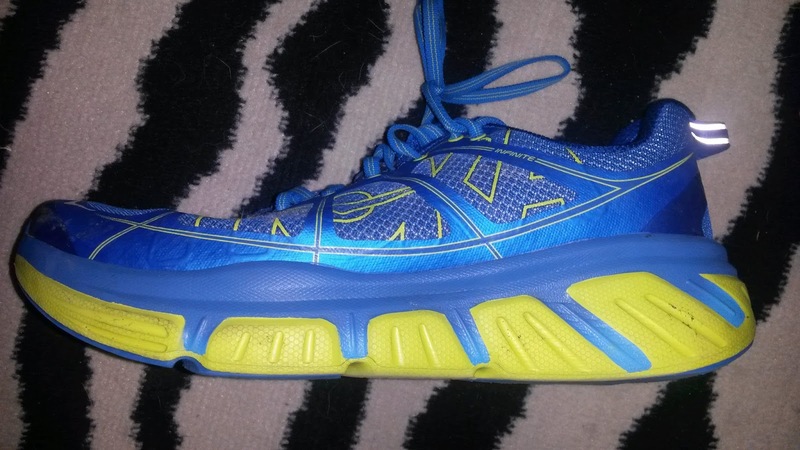 The relatively lighter and firmer ride has definitely grabbed my interest and I am excited to see Hoka continue to move in this direction. I still am adamant that I want to see the flexibility issue with Hokas addressed somehow. I do not know if flex grooves could be integrated better into the midsole, but the artificial and excess toe spring leaves something to be desired. Although it would be nice for those with a stiff first metarasal phalangeal joint. However you should probably see a medical professional about that instead of hiding it with toe spring unless you know it is stuck for any variety of reasons. These shoes were a bought for $31 on Ebay. I put at least 75 miles on every pair of shoes before I review them (except racing flats which I put on at least 25 miles). Currently I have 92 miles on my pair.